Because of their conformation, these dogs are prone to a number of health issues affecting the upper airways vertebrae and tail. Brachycephalic’s have stenoric nares and elongated palates. If untreated, these can progress to brachycephalic syndrome. Stenotic Nares are nostrils that are extensively narrow, due to a congenital (birth) defect of nose cartilage. Air cannot flow smoothly through narrow nostrils, so increased respiratory effort and noisy breathing result. The nostrils can be widened so that air can flow easily into the nasal cavity. An Elongated Soft Palate refers to the soft structure at the back of the roof of the mouth, after the hard palate. In brachycephalic dogs, the soft palate is longer than normal and hangs down into the back of the throat. This elongation interferes with airflow into the windpipe (the trachea), resulting in laboured breathing. The palate can be trimmed to an appropriate length so that it will no longer interfere with normal air flow into the larynx. The turbulent flow of air down the trachea can cause inflammation of tissue by the larynx. These tissues can become so swollen that they protrude into the main airway, and they are then known as Everted laryngeal saccules. Saccules can be removed, thus clearing the main airway. 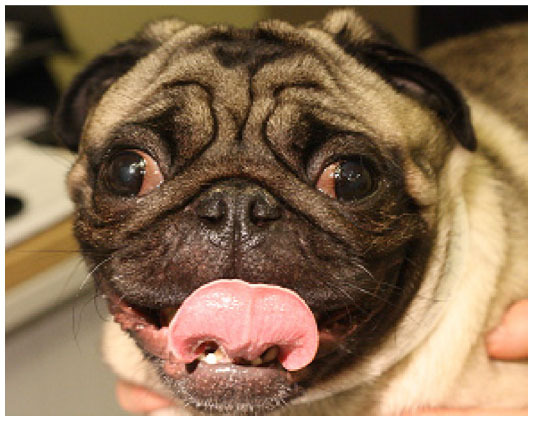 Some brachycephalic dogs may also have several secondary airway problems. BAS if left untreated can result in continued swelling and inflammation of all upper airway structures. The cartilage that supports the larynx to collapse. Similarly, the trachea may lose its structural support, making breathing more difficult and causing a chronic cough to develop. Common symptoms include snorting, noisy breathing, excessive panting and exercise intolerance. Heat, stress or excitement can often make clinical signs dramatically worse. Some dogs have so much difficulty breathing that they are unable to sleep for long periods of time. They can also occasionally turn blue and pass out from lack of oxygen where death can eventually result. Although the prognosis is optimistic if affected dogs have surgical treatment while still young, the outcome becomes more guarded in older dogs. Since dogs respond well to early surgical intervention, owners of brachycephalic breeds should have their dogs examined by a veterinarian surgeon as soon as possible if noisy breathing or other respiratory abnormalities are noticed. A Hemi-Vertebra is a congenitally deformed vertebra. It occurs when two or more vertebral bodies (the block-like portion of the vertebrae) fuse or develop asymmetrically; creating a wedging effect in what should be fairly rectangular block. The normal vertebrae have cylindrical vertebral bodies, which connect like heads on a necklace. The vertebral body of the hemi vertebra has not developed by symmetrically leading to a wedge shape. Fitting the hemi into the spine causes the spine to bend or twist. Pugs are famous for having what is called a screw tail. The screw tail results from hemi vertebrae in the vertebrae of the tail and is characteristic, even desirable in these breeds. Hemivertebrae of the tail are not a problem as there is no spinal cord tissue this far down and the result is an interesting looking tail with possibly a skin fold infection risk. The eyes are so prominent in brachycephalic breeds that the lids cannot close all the way over the eyes. This will lead to irritation and drying of the centre of the eye. If you cannot tell by watching your pet blink, watch as your pet sleeps. This condition is called Macropalpebral Fissure (eyelids too large for eyes). Dogs that sleep without closing their eyes all the way could do with surgical correction. Eyelid problems are common in these breeds. Look for persistent wetness around the eyes. In some dogs, the shape of the eyelids prevents normal tear drainage and there is an overflow. This problem cannot be correct surgically and is not uncomfortable for the pet; however, there is a more serious condition, which looks similar. The second condition involves the rolling inward of the eyelids such that the lashes rub on the eye. Surgery may need to be correct this problem. Chronic irritation will show as a pigmented area on the eye surface, especially on the side nearest the nose. This is hard to see without bright light, but if is noted, a search for the cuase is warrented. How you can protect your Brachycephalic Dog?